Nickel slag is a solid waste residue produced by smelting nickel-iron alloy. Nickel-iron alloy is mainly used for stainless steel production. Therefore, nickel slag is also called stainless steel slag or nickel iron slag. Due to the limitation of nickel-iron smelting technology, nickel slag contains a certain amount of nickel-iron alloy. The price of nickel-iron alloy varies according to the nickel content. Many customers are looking for the recovery of nickel-iron alloy from stainless steel slag. The industry hopes to obtain considerable economic benefits. Therefore, chaeng utilizes the new vertical mill grinding technology, and after a large number of experiments and cases, it can better grind the nickel slag into a fine-grained product, and achieve independent design and manufacture an annual output of 300,000 tons to 100. Ten thousand tons of nickel slag production line project equipment. The recycling of high nickel slag not only reduces resource waste and environmental pollution, but also produces considerable economic benefits. The use of wet fly ash, nickel slag instead of clay, iron ore ingredients in the modern kiln decomposition kiln production clinker, in the raw material grinding through the adoption of corresponding technical measures and changes in raw materials to solve the large-scale unloading drying Grinding, due to the difficulty in grinding the grinding silica, the material size is large, the high moisture content of the fly ash material affects the production and quality of the mill; in the clinker calcination, the material is difficult to burn, the firing temperature is high, and the raw material contains unburned The problem of using coal to produce high-quality clinker; the use of fly ash and nickel slag in the production of cement, the cement grinding ability has been improved; the mixed material uses more than two kinds of industrial waste residue, which enhances the adaptation of concrete additives. The process of slag discharged during the nickel making process is comprehensively utilized or does not pollute the environment. According to the production process of nickel, nickel slag can be divided into nickel smelting slag and nickel wet smelting slag. Nickel fire smelting slag is a molten slag produced during high-temperature smelting of nickel, which is naturally cooled to form a block or by forced cooling to become a granular solid product. In the nickel joint venture. Each production of n-nickel produces about 9 to 20 tons of smelting slag, and its chemical composition varies with the smelting method. Generally, the chemical composition (%) of the nickel smelting slag is: Fe 15 to 30, SiO 2 30 to 45, CaO 5 to 20, MgO 10 to 20, Ni 0.1 to 0.3, and Cu 0.1 to 0.2. The main mineral composition of the slag is olivine, followed by vitreous, magnetite, chromite, and periclase. Nickel fire smelting slag has a low utilization rate and is partly used for the production of cement, slag wool and cast stone. The fine nickel fire smelting slag is mixed with water glass to produce high strength, waterproof and sulfate resistant cementitious materials. The water quenched nickel slag can be used to make bricks and prepare fire resistant (800 °C) concrete. 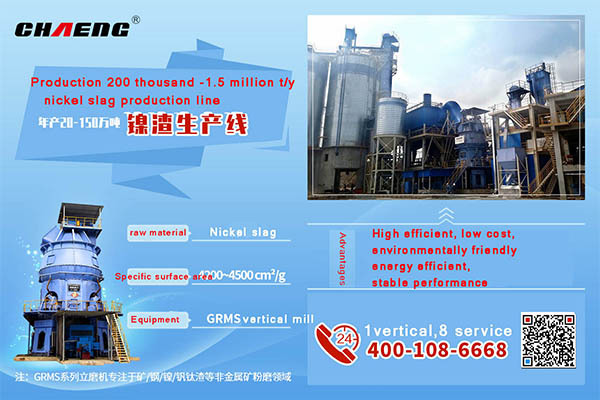 In the nickel slag grinding system, Chaeng GRMS46.41 mine|nickel slag vertical mill is used. The wet nickel slag is metered into the vertical roller mill feed port after being metered by the belt conveyor. After grinding, the nickel slag powder is collected by the long bag pulse dust collector and then transported into the nickel slag powder storage by the air conveying chute and hoist. The vertical grinding machine slag is re-feeded into the vertical mill by the belt conveyor and the bucket elevator. An electromagnetic iron remover is arranged on the spit conveyor to remove iron. This type of matching greatly reduces the grinding power consumption, grinding noise and civil construction investment, and integrates drying and grinding into one. It is one of the systems widely used in the current large-scale nickel slag grinding system. In order to protect the environment, all the dust points of the whole plant are equipped with air box pulse bag type dust collector. In the equipment selection, full consideration is given to increasing the filtration area and reducing the filtering wind speed to ensure the dust concentration of the exhaust gas is ≤20mg/Nm3. In the conveying system, the air conveying chute and the bucket elevator are used for the finished product transportation, which not only solves the shortcomings of the long-term operation of the pneumatic conveying equipment, but also reduces the handling of a large amount of dust-containing gas by pneumatic conveying. In order to save the capital investment, the equipment should be placed in the open air as far as possible under the conditions of meeting the production requirements, which not only saves the civil construction cost, but also facilitates the equipment maintenance in the future production process of the factory.